Last week, as part of the Lucas Oil Drag Racing Series, racers Monte Green and Don Kritzky faced off to prove who’s ride had more brawn. You know, typical stuff. However, just seconds after blazing off the starting line, it became apparent that this race was not going to end well… for BOTH drivers. Hitting disaster first, Green’s dragster began to wobble about halfway through the short race before flipping and barrel rolling right before the finish line. Kritzky, on the other hand, appeared to be running smooth through the finish line, but then he somehow lost control of his vehicle and he too began a barrel roll of his own. It’s unclear if Green’s initial accident had any effect on him, but it would be no surprise if that was the case. 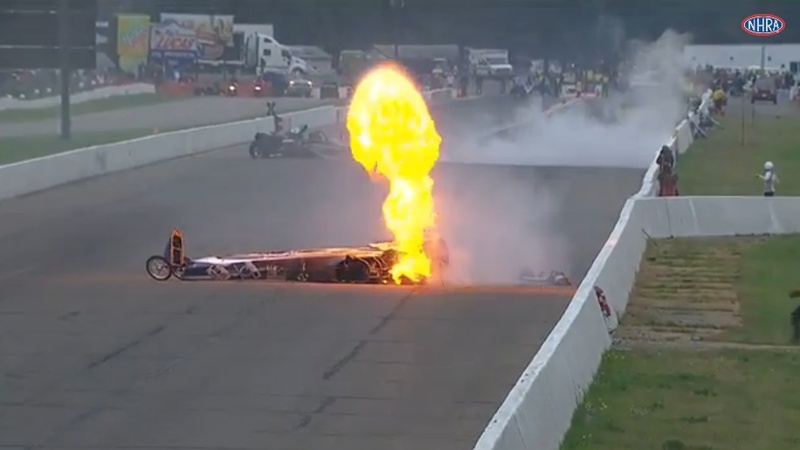 After flipping, Kritzky’s ride frighteningly caught fire as the emergency team ran out on the track to douse it. Kritzky was alert and conscious afterwards, but he was airlifted to North Memorial Medical Center in Minneapolis for further evaluation. Fortunately, a few fans have set up a Go Fund Me page to try and help Kritzky pay his medical bills and restore his racing career. So far, in one day, the campaign has raised over $2,000. This entry was posted in Culture and tagged barrel roll, dragster, NHRA. Bookmark the permalink.